Oven Browned Potatoes satisfy so many cravings. They are crispy on one side, soft on the inside and super flavorful. A simple dish that takes 10 minutes to prep and 30-40 minutes in the oven. Sit back and relax while they bake. Oven Browned Potatoes, simple goodness. Hi. 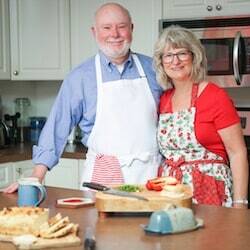 It’s Lois in the kitchen with an idea for supper. 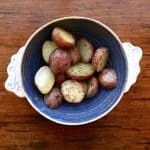 Oven Browned Potatoes, one of my favorite ways to make potatoes, is so simple. Crunchy on the outside; soft on the inside. A bit like French fries, but more softness on the inside. And certainly healthier for you than French fries. 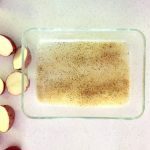 Another Easy Peasy recipe that allows you to pop it in the oven and relax until your meal is ready. Everyone will love them. 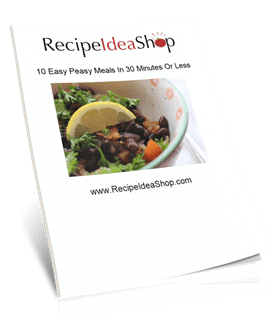 Serve them with Breaded Baked Pork Chops, Swedish Meatloaf, Easy Lemon Chicken, anything! How About a Fun Apron? I’m one of those cooks who always wears an apron. I’m a messy gal. These are kinda fun, doncha think? Spread the oil and spices over the baking pan. Cut the potatoes in half. Oven Browned Potatoes, ready for the oven. Oven Browned Potatoes, ready to eat. Crispy on the outside, soft and delicious on the inside. Simple recipe. 5 minutes prep. 40 minutes bake. Eat. Peeling the potatoes is not required, but you can do it if you like. Little red potatoes work perfectly simply washed and cut in half. Toss the potatoes in the olive oil and spices OR spread the oil and spices evenly over a baking dish. 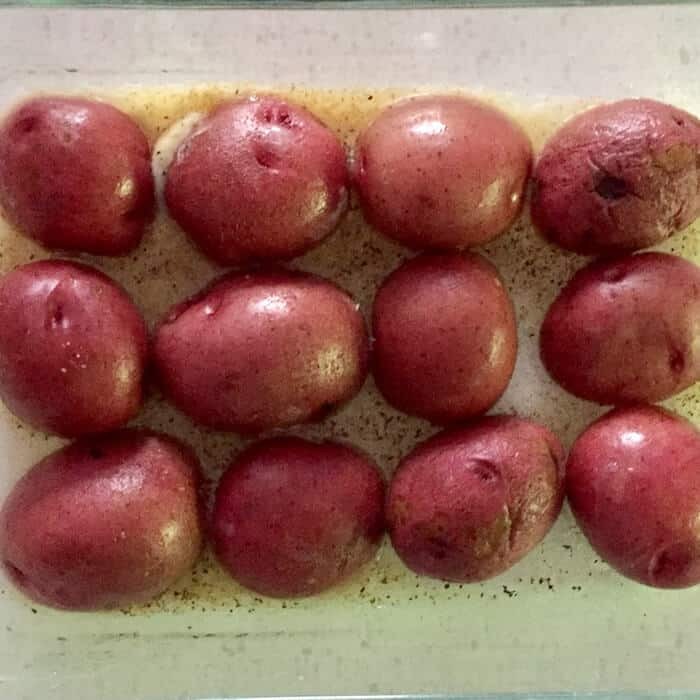 Place the potatoes, cut side down, in a single layer in a glass baking dish. 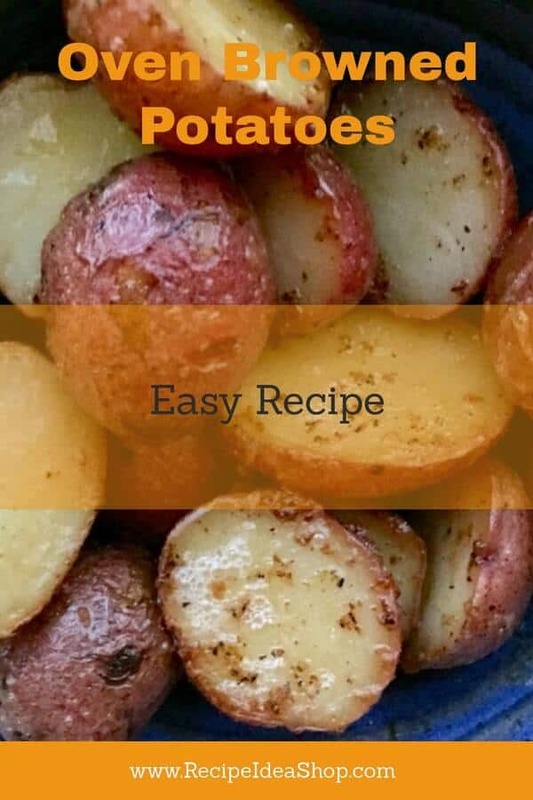 Bake at 350F degrees for about 45 minutes until a fork goes in easily and the potatoes are browned. 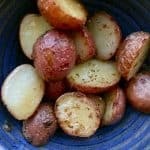 Another way to do it is to cut the potatoes in half and parboil them for 8-10 minutes in water, or microwave them for 3 minutes. Drain them and then toss them in a bowl with the oil and spices. Place them cut-side down on a cooking sheet. Bake them for 30 minutes at 375F degrees until tender and browned. Oven Browned Potatoes Nutrition Label. Each serving is 2 small potatoes (or 4 halves).